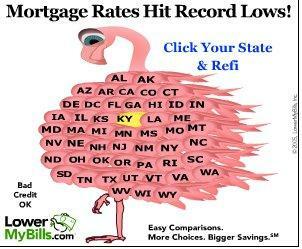 LMB doesn't stop with flamingos when using birds for its ads. It defiles all types of waterfowl, real and imaginary. 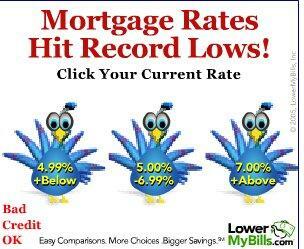 Above, we see two other bird-related ads. The first is a pelican, which also moonlights as a flasher. The second is a mythical bird, that lives only in the ad-maker's imagination. 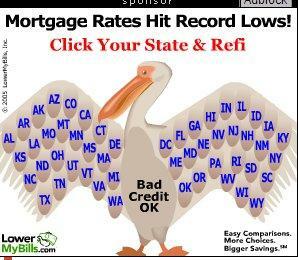 Even the bird seems perplexed that not one, but three of its ilk exist, solely to advertise percentages on their chests. LMB seems to have located the most anorexic crack-whores available in America for its cheerleading team. The over-sized eyes and the pleading expressions cry out in unison, "Will you give us a hit if we wave these pom-poms?" The sadness in the flamingo's eyes are heart-breaking. Its lovely coat of flaming pink feathers is marred by the appearance of Kentucky, which is yellow for some reason. Dismayed by the imperfection, the flamingo can only hope that salvation can come in the form of a lower mortgage.